The other was swollen shut, but he could see dim artificial light through the slit of his puckered flesh, so he knew at least the eye was still there. He saw the source of the light, a buzzing lumidome set into a permiform ceiling. 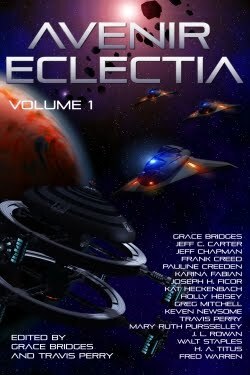 There was a constant rattling and sifting of blowing gravel and a howling wind outside, so he knew he was still on Eclectia. He tried to sit up but could do no more than touch his chin to his chest before he was overcome by muscle pain. He hurt all over. He tried wiggling his toes and fingers though, and was relieved to find everything in working order. There was a slight figure seated just behind his feet, which were hidden beneath a coarse blanket. It was a girl with dirty blonde hair and striking blue eyes. She was young, but swaddled in dirty robes and an exposure suit, with a cracked bandolier over one skinny shoulder. She had a long pike across her knees, the sort he’d seen the bug hunters carry. A curtain was swept aside and a tall, rough faced man entered, a metal plate of steaming food in one ash-blackened hand. He let the question hang and raised his eyebrows. Lyn rose from the stool and handed the pike to her father, who took it, along with her seat. He laid the plate of food on Considine’s legs, and Considine’s belly growled. He couldn’t remember the last time he’d eaten. “Go on, have at it,” Dressler said. Considine sucked in his breath, coughed the hard air, and groaned with the effort of sitting up. “Only few hours. You say you’re an Inspector. Where at? Avenir?” he glanced up at the ceiling. Considine picked up the plate of brownish looking food and dug in with the fork, chewing ravenously before he could answer around the mouthful. “Thanks for taking me in. I’ll see my office reimburses you for fuel and time,” Considine said, though he thought, if they don’t arrest me when we get there. Dressler waved him off, then perked up. “Sounds like Yulaura’s back.” He stood up. “Sure you don’t wanna rest up some?” He stopped then, and cocked his head. “What is it?” Considine asked, scarfing down the last of the bomber-eggs. He heard a new sound weaving through the constant blowing grit rattling against the domicile. A whirring, the sound of engines, but too smooth and refined for a land rover. Then the wall of the room blew apart in a burst of fire and permiform.